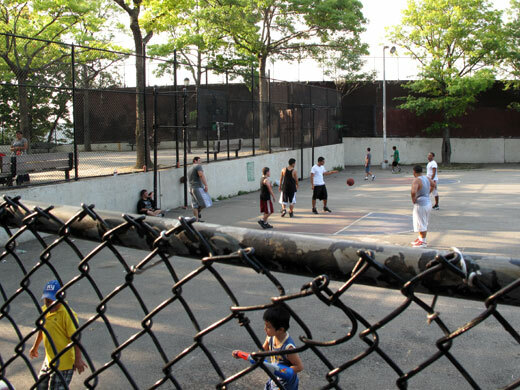 Thanks to SUDS, the Sunnyside United Dog Society, the basketball court at Lou Lodati Park on Skillman Avenue will be moved back to make space for a 45×90-foot dog run. Rick thinks that his group has long earned its exclusive area within the park on Skillman Avenue. Over the years SUDS has tried to clean up and keep the park safe at night. To the delight of SUDS, Councilman Jimmy Van Bramer announced in a recent press release that he has secured funding for an official dog run inside Lou Lodati Park. SUDS’s activities extend far beyond the park’s borders. Once or twice a year the group organizes “Pick-up the Poop Day,” and its members have raised funds for sick dogs and taught children who stop by the park how to properly take care of the animals. “Sometimes the park becomes an impromptu classroom,” says Rick, who hopes to soon offer classes on dog behavior and training for kids. 28 years ago, two days after getting his American drivers license, Ata Sheikh almost made a wrong turn from 48th Street onto Skillman Avenue. 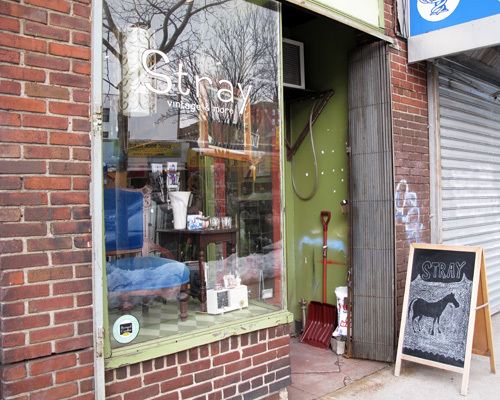 When he noticed that Skillman Avenue was a one-way street, he turned around. Before turning, though, he spotted an empty store. The next day he happened to see the very same store advertised in the paper and decided to buy it. While his wrong turn had quickly turned into a right, the process of becoming a businessman happened step by step. Originally from Kashmir in Pakistan, Sheikh used to work for an import-export firm in Saudi Arabia. During his month-long vacations he traveled around to see other countries. He has always been the adventurer in his family and is the only one who left Pakistan. While Sheikh and I talk, the lottery machine rings incessantly. 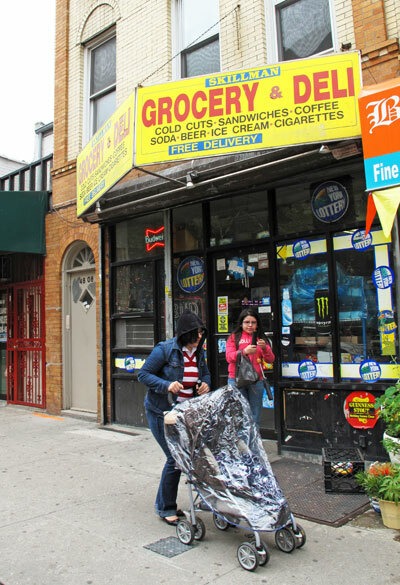 40% of the store’s income derives from lottery tickets and scratch-offs, the rest from soda, beer, snacks and toiletries. 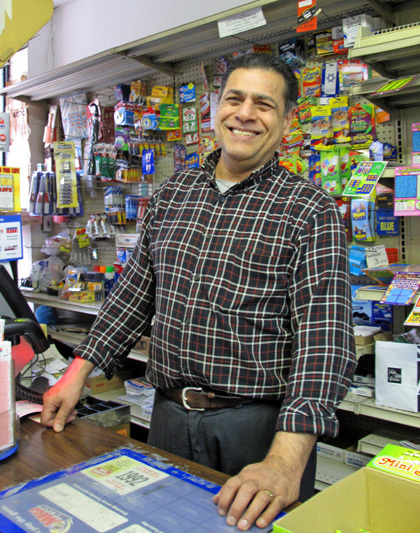 Asked to tell a funny story having to do with his store, Sheikh returns to the reason why he ended up on Skillman Avenue. In the podcast he tells this story as his favorite joke. 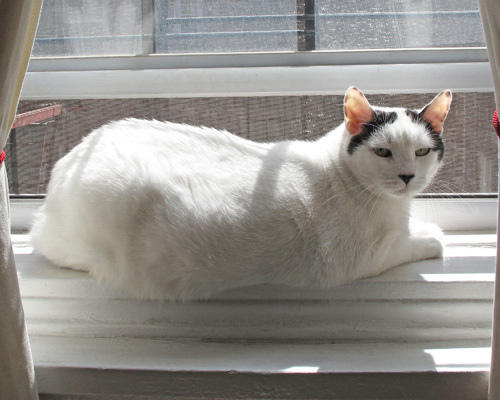 Sherry Gamlin, who has organized the Sunnyside Shorts Film Festival since 2007, lives with her cat Betty on 44th Street in Sunnyside. While she jokes “Betty is my longest relationship,” Sherry isn’t a quite what you would consider a wallflower. 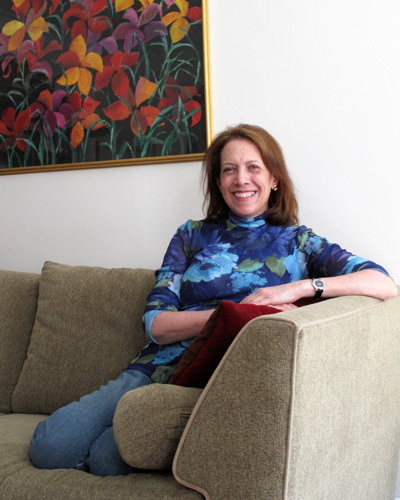 Energetic and endowed with a twisted sense of humor, Sherry enjoys mobilizing large crowds and getting attention far beyond her neighborhood borders. In the past the short film festival has drawn an audience of over 200 people and submissions from all over the world. The fourth edition will take place on September 25th, 2010 at Sunnyside Community Services. 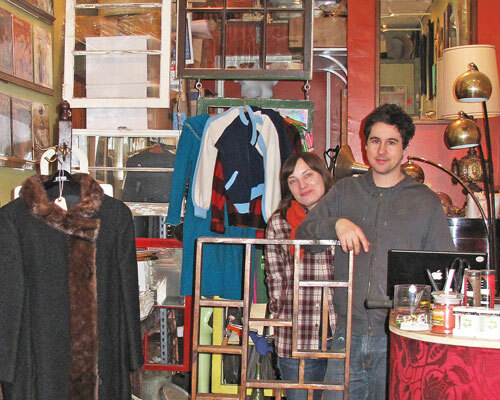 Last year Sherry and her friend Teresa Ward organized a fundraiser at Claret Wine Bar on Skillman Avenue. People played games and celebrated while helping to pay for the space rental fee, the technician who sets up the screen and projector, the photographer who documents the event, as well as flyers, programs and advertising. At the end of our interview, Betty reappeared from the linen closet to listen to Sherry talk about the three short films she made before the Sunnyside Shorts Film Festival started taking up all of her spare time. While I was briefly distracted by Betty’s large black spot on her otherwise white behind—“I found her in an inkwell in Sunnyside Gardens,” Sherry joked—I decided to feature this excerpt from our conversation for its humor and originality. In his spare time, Paul visits friends, hangs out with “the usual suspects” on the block, paints, plays the drums and listens to Jazz. 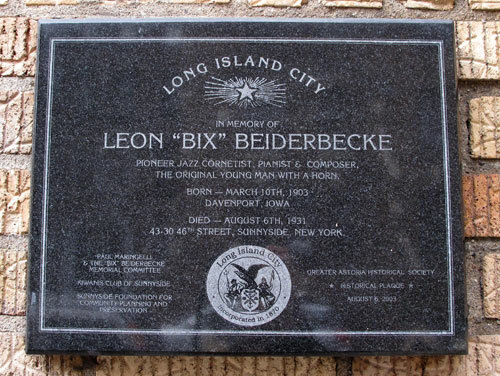 When the jazz enthusiast heard that jazz legend Leon “Bix” Beiderbecke lived and died in Sunnyside, he began to research Beiderbecke’s last address. To Paul’s surprise it happened to be right across the street from his home. “Beiderbecke moved into Sunnyside and died,” Paul says, laughing. Despite Bix’s short Sunnyside stint, Paul encouraged community leaders to put up a commemoration plaque. In 2000, he started organizing the Bix Beiderbecke Jazz Concert. Last year the concert counted 14 jazz musicians, some of them quite renowned. It will have its tenth anniversary on August 7th 2010, and, for the second time, take place under the Sunnyside Arch. Dressed in a shiny black leather coat and a leopard scarf, Paul walked me to Bix’s plaque on 46th Street. 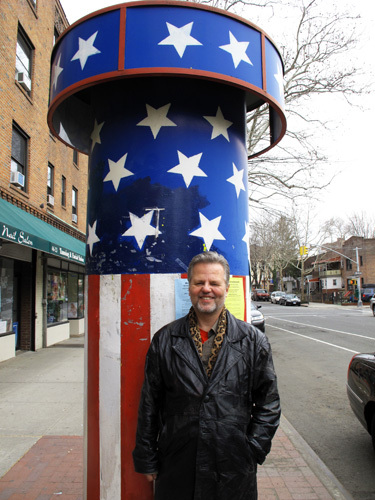 On the way he showed me the advertisement column on Skillman Avenue and 47th Street, which he painted after the events of 9/11. 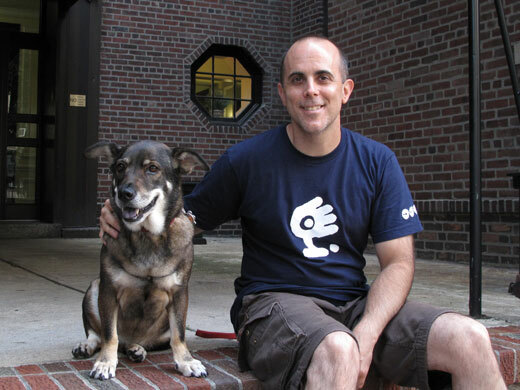 In the podcast Paul talks about his search for Bix’s last address and Sunnyside’s jazz-infused past.